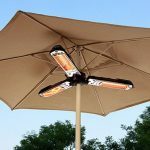 What we found in our umbrella patio heater reviews is that it is sometimes more convenient to keep the patio umbrella up at night and turn the umbrella patio heater on to stay warm. The umbrella works as a shield for the wind and makes the warmth radiate down and not get lost in the wind. 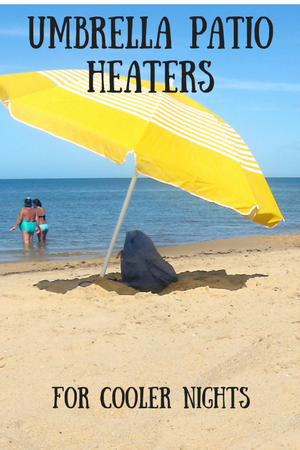 We have tried to find the highest rated under the umbrella patio heaters and here we will give a short review and than provide a link to a more extended review on their own page. 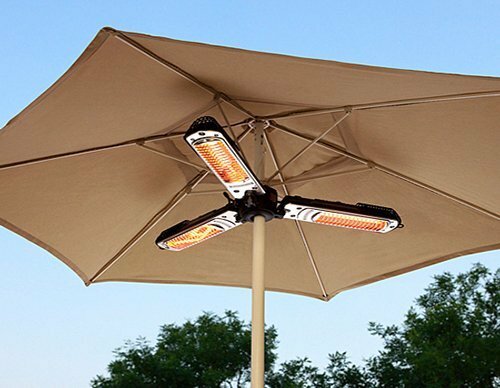 The Az company does not need a lot of introduction since it is one of the largest producers of patio heaters. The az electric patio heater we review here is on their most sold models and receives an overall of 4 stars out of 5. It can be fired up to 1500 Watts in a few steps and this makes it easy to use on cool nights and the setting can be adjusted to how much heat you need. 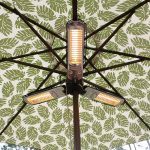 Fire Sense is an other brand that is well known and does not need any introduction for their umbrella or parasol electric patio heaters. We have reviewed the one with the highest customer ratings.